I admit that over the years I have not only begun to understand but even sometimes enjoy Baierl humor. They are a funny lot - those Baierls. Dry, witty humor is their specialty. I am more of a slapstick humor girl but I am learning to adjust. 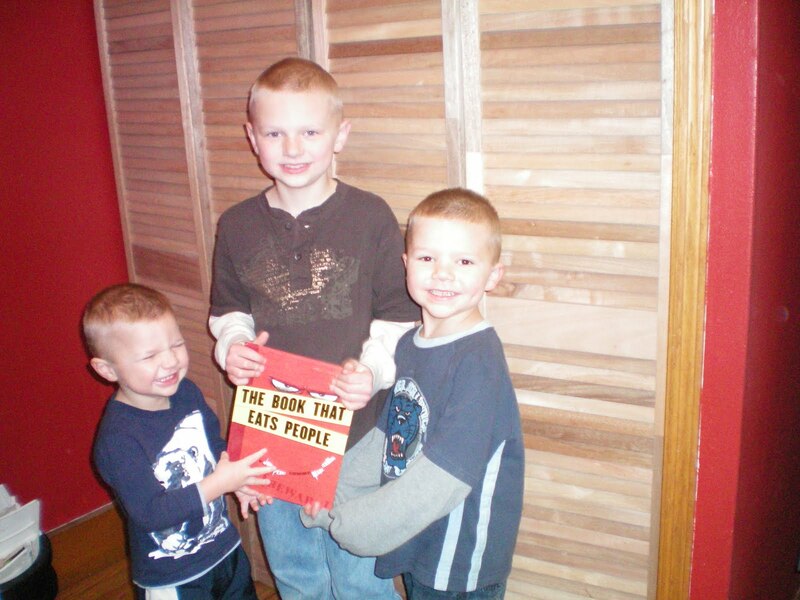 So no surprise that the book Grandma Rose sent us is a HUGE hit! "The Book That Eats People"
An especially great encounter for Caleb who is really reading like a champ now. Not only did the boys delight in getting a package with their names on it , but the book was Baierl Humor at it's finest. They all gathered around and read it together with Olivia my daycare girl. Now, she is not subject to Baierl humor often, so she was actually scared of the book and believed that it would indeed eat her. Ha. Poor newbie. The book has no happy ending and is a tad dark in its "BEWARE!" humor. But my boys all love it. They read it all the time and noone is the least bit scared. Thanks Grandma Rose!! !